Two new mom-friends of mine are due with triplets any day now (both past 30 weeks, and one at 35 and counting!). I have been meaning to visit them while they’re on bedrest, to listen to their fears and hopes, to offer my experience and advice when invited, to sit with the uncertainty and expectation. I spent much of the first year of triplet parenting in terror and shame by comparisons. How would I ever be able to do the things other parents did with their kids, even twin parents: take their infants to a coffee shop to meet up with other parents? Take my kids to parks or other outings by myself? What was wrong with me that I felt so panicky at the thought of being alone in so many environments that seemed unsafe? The number of places I felt safe going solo was fairly small, and I often felt stuck. As they became mobile, I only went to fully-enclosed places, almost all of them indoors. I inched toward independence. At 9 months, we went on our first walk together, just the four of us. After that, we took lots of walks together. I figured out how to carry three babies up two flights of stairs by myself. 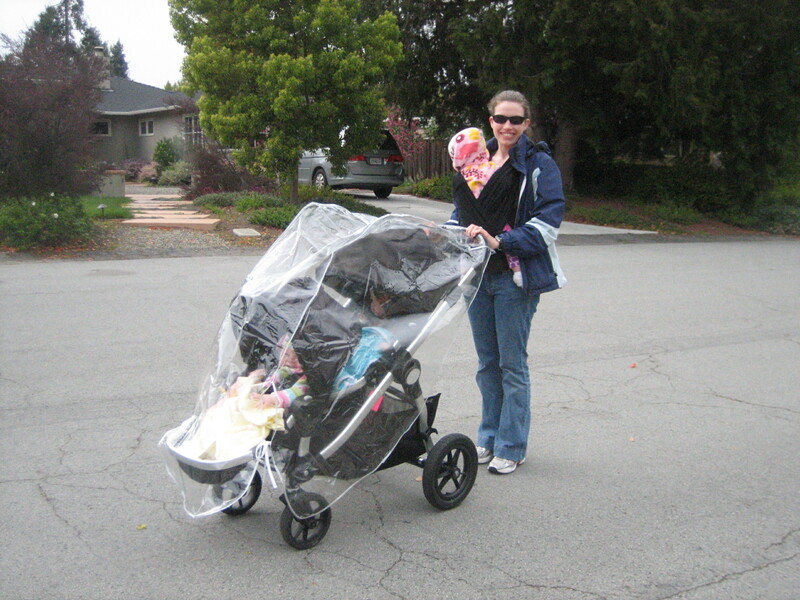 For outings, I started where all three could be strapped in: quick trips into stores with a kid in the Ergo and two in the double jogger, to Target where they have shopping carts with seatbelts for three. A short trip recently to Whole Foods with a kid in the Ergo, one in the cart seat, and one in the cart bucket (obviously not for a week’s worth of groceries). Then to music class when our nanny was sick–again, a confined space. 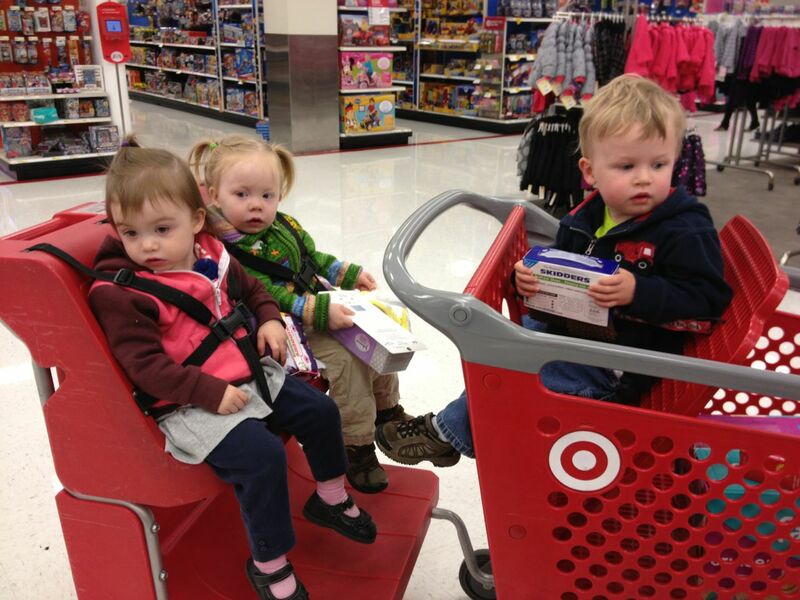 They LOVE sitting in the shopping cart. Our nannies current and former all took the kids somewhere outdoors by themselves. Jamie’s favorite thing at the aquarium: looking at the ferris wheel on the next pier. Theresa plays peek-a-boo in our new play house. Here’s what I have realized in the almost two and a half years that I have been a parent: a) I should have been nicer to myself, because b) being outnumbered three-to-one is SO HARD. Because yesterday, we went to the zoo, and our nanny took Theresa who wanted to see the elephants, and I took Jamie and Audrey who wanted to see the hippos and giraffes. They ran ahead, or stopped to pick up a cool stick, or look at an interesting sign, and ran some more, and saw lots of animals. And it was SO EASY. Tracking two? A hundred thousand times easier than tracking three. This is not to say that twin parents have it easy–absolutely not. It is not to say that parents of one kid have it easy–parenting is hard no matter how many kids you have. Do what makes you feel comfortable. Not what other moms do, or what you always thought you’d do. Everything is scary with three little ones, so the first time you’re home alone with them, the first time you put them all to bed by yourself, the first time you take them all for a walk: it’s a lump-in-the-throat, giant leap into the black hole of stress. But it’s worth it. You won’t always feel stuck. And when you do succeed, you will feel like you can conquer anything. On Tuesday, I took all three 2 1/3-year-olds to the playground. By myself. It felt safe. Comfortable. I can do this. You will get there, I promise. I’ll be cheering you on. Twins are difficult, I can attest. But three? In a cold climate? It must have taken two hours just to get out the door! These are big victories!! Wonderful message! So glad y’all had such a wonderful time! 3 happy toddlers and one amazing Mom!